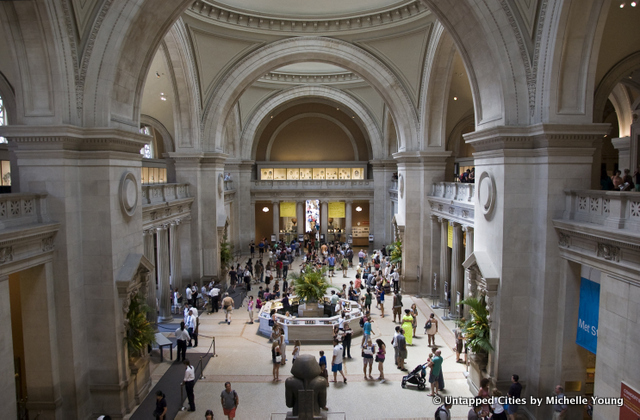 Have you ever taken a tour of the secrets of the Metropolitan Museum of Art? Well, that’s exactly what you’re going to get here. We’re sharing all the little known facts we know about the museum. This is less about the unparalleled art collection, for which guides abound, but more about the tidbits that make the building like none other in the city. It’s about its architecture, its rich history, and the hidden gems to look out for on your first, second, and umpteenth visits to the museum. Rather than one building, the Met is more like a jumbled collection of wings and various building campaigns. Over almost a century and a half, several prominent architecture firms played major roles in the museum’s growth, while many others also had a hand in the countless modifications, renovations, and additions that make the Met what it is today. The first Metropolitan Museum of Art was located in a brownstone at 681 Fifth Avenue, then in a mansion at 128 W 14th Street. All were temporary locations until a permanent facility could be built. A Central Park location for the museum was first hinted at in 1869 by publisher George P. Putnam. What ever happened to the very tall statues of men of africa.. Thank you very much for all of this interesting information about the Metropolitan Museum of Art, one of my very favorite places in the world! In the course of some research for a writing project, I am trying to determine when the exterior staircase to the building (on Fifth Avenue) first looked as it does today. From what I can ascertain here, the date appears to be 1902, and just wondering if you can kindly confirm that for me? Hi Mary Anne, we’re going to consult our expert on the MET Museum and get back to you! This was fabulous, thank you! And kudos on the Gossip Girl reference.